Place the grounded almonds, sugar, semolina, and 6 tablespoons of the orange flower water in a large mixing bowl and knead into soft dough. If the dough is too stiff, add 1 or 2 tablespoons of orange flower water. Lightly butter and flour some baking sheets. 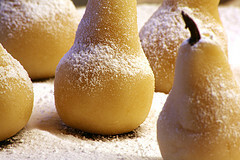 Break off small pieces of the dough (about the size of a walnut) and mould into small pear shapes. Insert 1 clove at the top of each pear to represent the stalk. Arrange upright on the baking sheets leaving some space in between them. Bake in a preheated oven to 150 degrees Celsius, 300 degrees Fahrenheit, Gas Mark 2 for about 20 minutes. After about 10 minutes of baking, cover the almond pears with parchment paper if the tops seem to be browning too quickly. 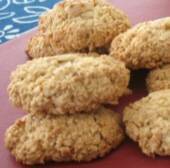 Remove from the oven and allow them to cool down. 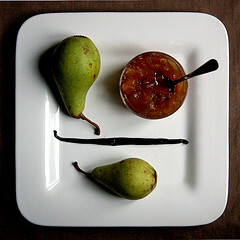 When the almond pears are cold, dip them very briefly into the remaining orange flower water. Place then back into the baking sheets lined with parchment paper and coat them with icing sugar. A few minutes later coat them once more with icing sugar. Amigthalota – Aclathakia (Almond Pears) got their name because of their shape and their main ingredient. Aclathakia (Pears) because they look like a pear. Amigthalota (Amigthala) their main ingredient – Almonds.